Hi friends! Shaun and I made it to the ABQ very late this evening. It's just after midnight here, but on east coast time it's after 2am! We are totally spent from a long day of traveling but are looking forward to a long day of sightseeing tomorrow. I need to get off to sleepyland, but I wanted to tell you about this pumpkin bread that I made and brought on the airplane with us. I adore pumpkin bread! Anything pumpkin, really. 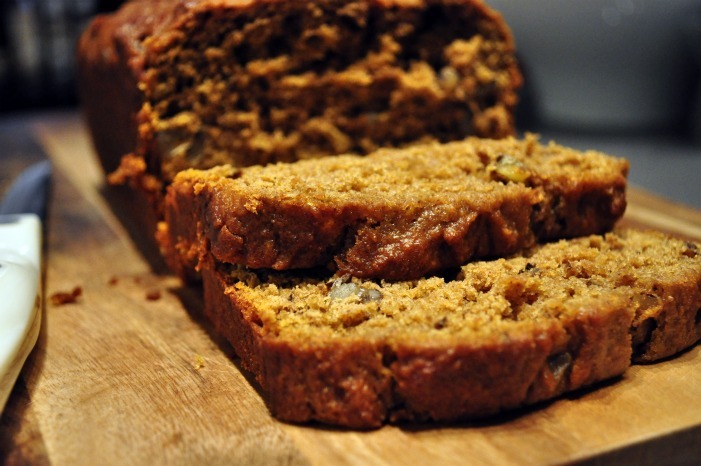 But there's nothing better than a good, moist, pumpkiny bread. The only problem? It's not exactly healthy...and certainly not healthy in the quantities in which I like to enjoy it :) When I came across this healthy version on Eating Clean Recipes, I knew I had to give it a try. Admittedly, I did not have high hopes for this bread, due to its healthy nature. I know that sounds bad, but no butter? Very little fat? How good could it be? Oh how wrong I was. I'm keeping this recipe in my permanent collection to make again and again. I feel confident that no one would even know it was healthy if I didn't tell them first. It was so good, in fact, that I made a loaf of it for the blogger Sweet Swap. When I received Matt at Fave Diets Blog for my swap, I knew this would be the perfect treat to send him. I did make a few alterations to suit my own tastes, and here's the recipe! Preheat your oven to 350 degrees and lightly grease a bread loaf pan. Whisk together the flour, baking powder, baking soda, salt and pumpkin pie spice. With a mixer, combine the egg, sugar, yogurt, pumpkin, oil and vanilla. Mix in the flour mixture until just combined. Stir in the walnuts. Pour into the bread pan and bake for 50-55 minutes, or until a toothpick comes out clean. So there you have it. 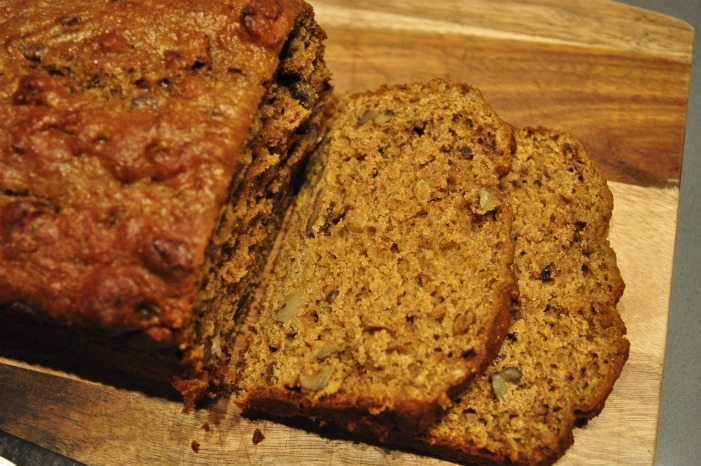 A delicious and healthy pumpkin bread made with Greek yogurt! Have you ever been surprised by a lightened up/healthified recipe?